Well these are different! These electroplated Britannia metal inkwells were made in Sheffield by Lee & Wigfull in the early 1900s. The tiered bases lead to elephant heads with raised trunks. 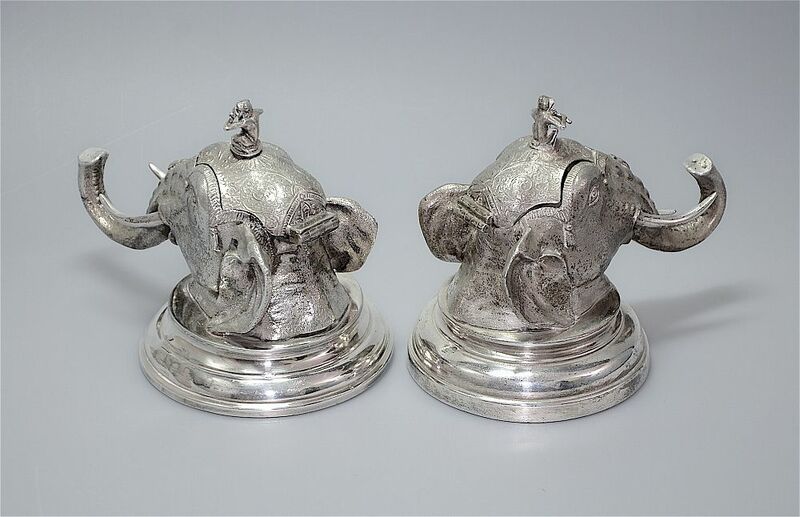 The hinged lids that are part of the heads have flute playing monkey finials. One well is blue glass, possibly original, the other well in green glass is a replacement. 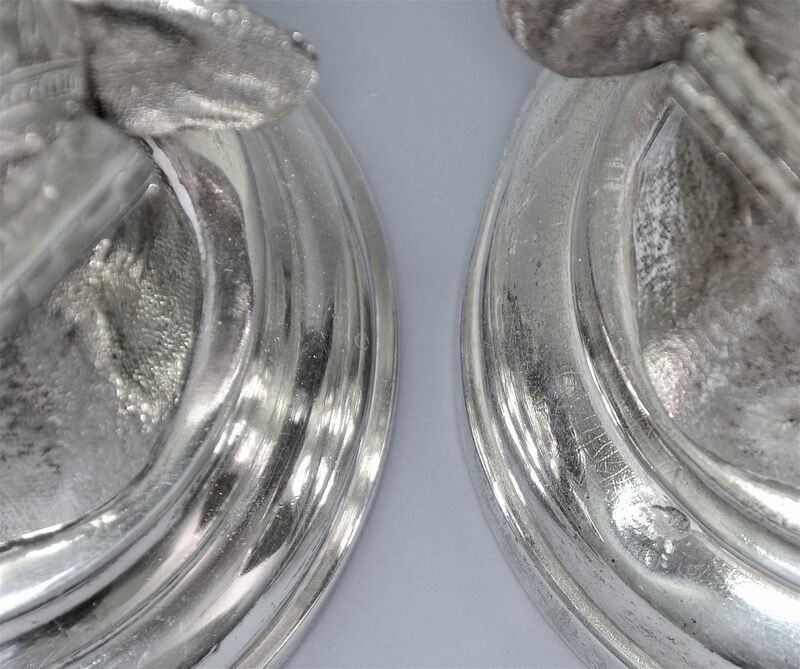 The base of one inkwell is impressed "L&W S EPBM" for Lee & Wigfull Sheffield Electro Plated Britannia Metal.They are not an exact pair as there are subtle differences and one may be an earlier cast than the other. 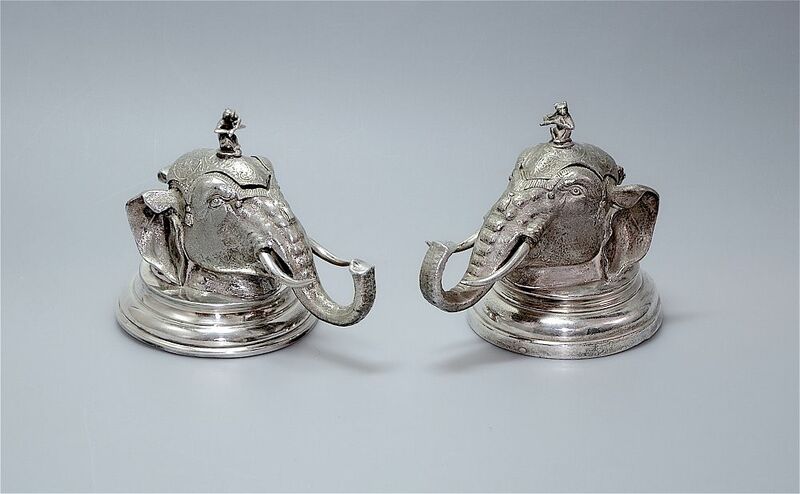 I love these quirky inkwells even though they are not our usual Art Deco objects. Founded in 1871 by George Shadford Lee (Senior Partner) & Henry Wigfull, a Britannia metal smith and son of the owner of Sheaf Corn Mills. By 1879 the business had been dissolved but Henry Wigfull kept the company name when he registered the silver mark ‘HW’. By 1881 he was employing 100 people in Stag Works on John Street, and had an office on Holborn Viaduct in London. The company also won a first-class award at the Melborne International Exhibition in 1880. The firm was converted in 1899 into a limited liability company under the style of Lee & Wigfull (Sheffield) Ltd. The firm used the trade mark INSIGNIA PLATE. The company continued after the Second World War, however, there were no longer members of the Wigfull family running it. By the early 1960s Lee & Wigfull became part of the Sipelia Group, and was last listed in 1969.